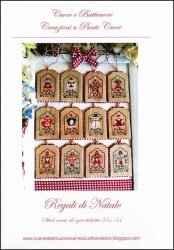 Regali Di Natale [H1646] - $14.66 : Yarn Tree, Your wholesale source for cross stitch supplies. Cross stitch pattern by Cuore e Batticuore. Here comes Santa Claus with the "Gifts of Christmas." With his warm wool & Santa hat, hopefully Mr. Sheep stays warm delivering a special Christmas present! Frosty the snowman is enjoying the cold bite of winter with a heart in each hand. Rudolph is bundled up with his scarf around his neck & two Christmas presents ready to be loaded in Santa's sleigh. It's beginning to look a lot like Christmas! Stitch count 33 x 54. Stitched on #8291 Zweigart Belfast Linen 32ct. Light Mocha.